My wife, Raven, and I went to see the musical film The Greatest Showman, starring Hugh Jackman, a week ago. Say what you will about the movie/story, but we thought that the soundtrack was phenomenal, and the songs have stayed with me over the last few days. They deeply move me! What is it that moves me? The Life, the Joy, the Light. I believe these are reflections of the Divine within us all. These songs are a celebration of Life! of overcoming our fears and obstacles, of transcending our selves, in becoming who we truly are meant to become, in being who we truly are already, in realizing our highest dreams, of not going gently into that good night, but of standing up, standing strong, opening our mouth, freeing ourselves to be our best Selves, in dreaming, in being visionaries, in believing, in creating the world how we dare think it should be, because we have the power to change the world. It starts here. It starts at home. It starts with our Self. I wouldn’t call it a biopic. It’s inspired by [P. T. Barnum]. He is a fascinating guy. He is a flawed character, for sure. Which is good when you play him as an actor. But he’s an outlier, he’s a pioneer, he saw the world differently than anyone else. He would not take “no” for an answer, and it’s an inspiring story. I find that description similar to how many view the Mormon prophet Joseph Smith. Fascinating, flawed, outlier, pioneer, visionary, and yet his story is deeply inspiring to many. Some choose to “look for the Goodness in every person, every situation, every institution,” as the Buddhist teacher Culadasa (John Yates) recently urged. Hugh Jackman said that this musical is a “celebration of Life.” I agree! Regardless of P T. Barnum’s full life history, and despite the deep flaws he had, his story is what deeply inspired these screenwriters, producers, directors, actors, artists, songwriters, and vocalists. They focused on the Good, and made a fantastic musical in the process. We could all focus on the Good more often, and what inspires us, what moves us, what animates us to live, to love, to create, to share, to lift, to inspire others. 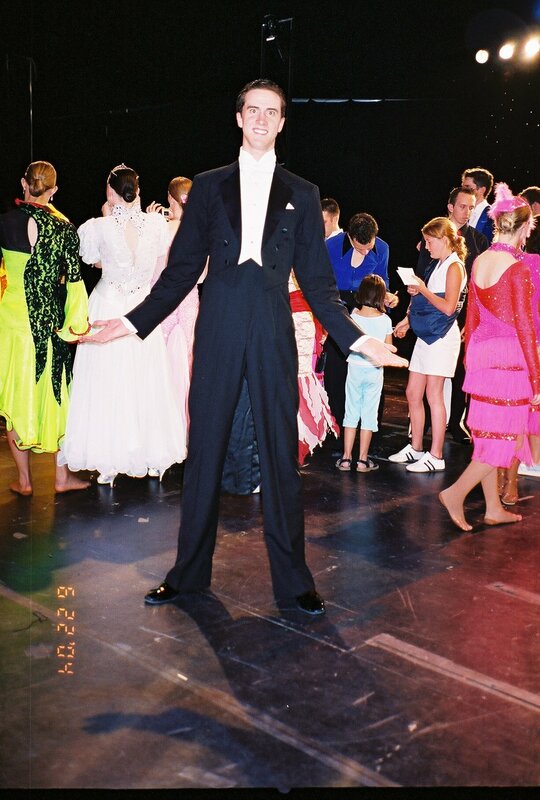 Me on a European ballroom dance tour in 2004. This music fills me with Joy! Having stood in the spotlight myself, on the stage in front of tens of thousands of people as a member of the BYU Ballroom Dance Company, I helped bring joy to their hearts, happiness to their minds, and smiles to their faces, in countries across the world. I can say from personal experience that such stage performances as portrayed in The Greatest Showman are a real celebration of Life, and I felt that Life myself on many occasions. I felt life erupt within me as I danced, in a flow that at times was a kind of mystical experience, the dance moving me. Thandie Newton also beautifully described how dance allowed her to “lose herself,” and feel a connected sense of Oneness and aliveness. My fellow dancers and I came alive on the stage, and the audience felt that life. It was palpable! Life should be celebrated in these ways! Through dance, song, celebration, and lights! I think it is for these reasons that dance has historically been a part of religion and spiritual traditions; it re-connects us to our Divinity, even the Life within us and all Beings (see my paper on “The Genesis of the Round Dance“). At the 75th Golden Globe Awards on January 7, 2018, the The Greatest Showman receive three nominations for Best Motion Picture (Musical or Comedy), Best Actor (Musical or Comedy, Hugh Jackman), and Best Original Song (“This is Me,” Benj Pasek and Justin Paul). It won the Best Original Song, even running against the excellent song from Disney’s Coco “Remember Me” (which also has a heartfelt message). The album also landed #1 on the Billboard 200, a first for the songwriters Pasek and Paul. I want to share this album with you, below. Consider the lyrics, and let them wash over you. Keala Settle, who plays the role of Lettie Lutz, the bearded lady in the film (a character based on Josephine Clofullia and Annie Jones), sings the song “This is Me,” and apparently was part of the inspiration for the song, according to the songwriters, Benj Pasek and Justin Paul. Interestingly, Settle was raised in the Mormon faith, as myself. She gave a wonderful rehearsal performance of the song, which was filmed (a must see! below). “This is Me.” And it moves me deeply, as it has many others. Hugh Jackman said that this was his favorite song of the film, the “anthem” and “heartbeat of this musical.” The lyrics and music speak for themselves. It is a celebration of Life! Another song from the film is “From Now On,” sung by Hugh Jackman. It also had a wonderful rehearsal performance, which was recorded (a must see! below). It recalls the journey through the dark night of the soul, as the main character experiences in the film. The lyrics and music speak for themselves. It is a celebration of Life! Another song in the film is “Come Alive,” sung by most of the main cast. They did a live performance of this song which was filmed, below. The lyrics and music speak for themselves. It is a celebration of Life! Another great song from the film is “Never Enough,” sung by Loren Allred. The lyrics and music speak for themselves. It is a celebration of Life and Love! Another great song is the opener, “The Greatest Show,” sung by Hugh Jackman and cast. The “greatest show” is this LIFE! It is this Life. All that you know, so tell me do you wanna go? Another beautiful song is “A Million Dreams,” sung by Ziv Zaifman, Hugh Jackman, and Michelle Williams. I have also had a million dreams keep me awake at night, visions of what the world could be. This is the world I hope to make. Yet another great song is “The Other Side,” sung by Hugh Jackman and Zac Efron. Another song is “Rewrite the Stars,” sung by Zac Efron and Zendaya. And the last song is “Tightrope,” sung by Michelle Williams. I enjoyed reading this and agree with the joy and positive energy that comes from these songs (not to mention, they are catchy!). Without question, we do need more love and acceptance in this world! Thank you. It was and is very inspiring to me, most particularly the soundtrack. Its message rings true very deep in me, and it seems in many others as well.